The Red Planet's brush with comet Siding Spring on Sunday was a close encounter of the best kind for science, a once-in-a-lifetime chance to study a pristine remnant of the solar system's birth 4.6 billion years ago, as it makes its first and possibly last visit to the warmth of the inner solar system. Comet C/2013 A1, discovered last year at the Siding Spring observatory in Australia, was expected to pass within about 87,000 miles of Mars at 2:27 p.m. EDT (GMT-4) at a relative velocity 126,000 mph. An international fleet of spacecraft at Mars, two surface rovers and five orbiters -- including a newly-arrived NASA satellite built to study the martian atmosphere -- had ringside seats for the high-speed flyby. Monitoring from afar were the Hubble Space Telescope and more than a half-dozen other spacecraft, along with telescopes at ground-based observatories around the world. "It's awesome. It's such a ridiculously close approach to the planet," said Karl Battams, an astrophysicist and comet expert at the Naval Research Laboratory in Washington. "We've got these fantastic spacecraft out at Mars. ... It's an extraordinary coincidence, and I think we're very lucky to see it. It could well be we don't see anything like it again in our lifetimes." Observers in the Southern Hemisphere were able to study Mars and the comet during close approach, but it was not bright enough at Earth's distance to be visible to the unaided eye. 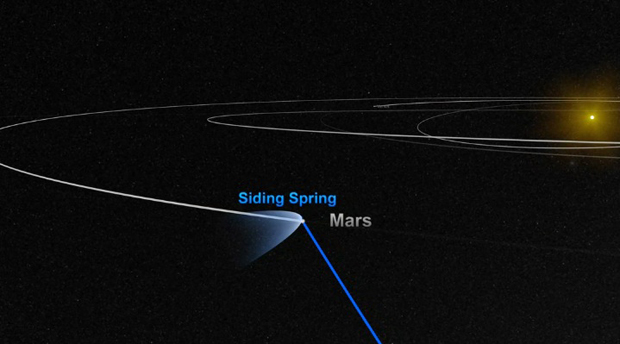 Complicating the picture, Siding Spring has faded considerably in recent weeks as it swings past Mars and on toward perihelion -- closest approach to the sun -- on Oct. 25. "We were really pleasantly surprised at how it was behaving until about two weeks ago," Battams said. "And then, suddenly it started to drop in brightness much faster than we had anticipated. So now we're sort of re-assessing our expectations of the comet and the model we were judging it against." Even so, NASA's Mars Reconnaissance Orbiter was expected to have a good view. Commands were uplinked earlier to aim its high-resolution HiRISE camera at the comet in a bid to image its hidden nucleus. The agency's MAVEN orbiter, which arrived at Mars last month, was poised to look for changes in the martian atmosphere due to interactions with the comet's dust tail. NASA's Mars Odyssey spacecraft, along with the European Space Agency's Mars Express orbiter and India's first planetary probe, the Mars Orbiter Mission, or MOM, also trained their instruments on the comet, as did NASA's two surface rovers, Opportunity and Curiosity. "The closest a comet has ever approached Earth in modern records is about 16 times greater than the distance of this thing going by Mars," Battams told CBS News in a phone interview Friday. "It's going to be the equivalent of one third the Earth-moon distance. So it's a really close flyby for some amazing instrumentation we've got at Mars. "Now granted, those spacecraft at Mars weren't designed for looking at comets," Battams continued. "But just by luck and a little bit of adaptation, we should get some really cool science out of it." But it will take time. The Mars spacecraft were not designed for real time data transmission and it likely will take the science teams hours to several days to receive and process the data before any pictures, much less conclusions, are unveiled. Siding Spring is of particular interest because it originated in the Oort Cloud, a vast spherical realm of icy debris left over from the original swarm of gas and dust that coalesced to form the sun and its retinue of planets 4.6 billion years ago. The Oort Cloud extends from well beyond the orbit of Pluto halfway to the nearest star, so far comets like Siding Spring need a million years or more to make the long plunge into the inner solar system. "We're going to observe an event that happens maybe once every million years," Jim Green, director of NASA's planetary science division, said recently. "And this is where a comet coming from the farthest reaches of the sun's gravity will come to the inner part of our solar system. This comet will fly right in front of the planet Mars. Mars will be blanketed in cometary material." Last year, another Oort Cloud comet -- ISON -- generated headlines as it fell toward a close flyby of the sun, breaking apart and fading from view as scientists looked on from a distance using sun-watching telescopes in orbit and on the ground. But Siding Spring is the first Oort Cloud comet ever observed at relatively close range with modern instrumentation, giving scientists a chance to study a pristine remnant of the solar nebula. And they have a lot of questions. "We're hoping the HiRISE instrument on MRO will be able to actually resolve the nucleus, actually see the overall shape of the nucleus spread over several pixels of its camera," Battams said. "And that'll be the first time we've ever seen an Oort Cloud comet nucleus. Then we'll know how big it is. It could be anywhere from one to 10 kilometers, but that could be off by a factor of two in any direction. We're really not sure." Another item of interest: The comet's brightness. Comets studied to date have all made repeated trips around the sun, going through cycles of heating and cooling. They tend to be dark. "This is a pristine object coming in, so maybe the surface will be unusually reflective or vice versa, maybe the surface will be unusually dark," Battams said. "Or maybe it'll look just like the other ones. But again, it's a new data point from a whole different subset of comets." Along with its size, scientist want to study its shape to glean clues about how comets formed in the Oort Cloud. Most comets studied to date have ranged from potato- or dumbbell-shaped bodies, irregular "dirty snowballs." A comet now being studied by the European Space Agency's Rosetta spacecraft features two distinct lobes that give it the appearance of a rubber duck when viewed from a distance. "We don't know what leads to the formation of those shapes," Battams said. "Is it that comets are sometimes formed in weird shapes and that's it? Or maybe as a consequence of being in the solar system for a long time they kind of take on a new shape due to erosion processes. "From looking at just one fuzzy little image of one Oort Cloud nucleus (Siding Spring), we're not going to answer the question," Battams continued. "But it's a data point. It's the first data point we've ever had. ... If the nucleus is completely spherical it sort of leaves the question open ended, but maybe we'll see another duck-shaped nucleus. Just purely from looking at it, it's going to tell us something." Of major interest is the comet's interaction with the martian atmosphere as the planet moves through the outer region's of Siding Spring's dust tail. Moving at a relative velocity of 35 miles per second, even tiny dust particles will impart energy in collisions with atmospheric particles. "MAVEN (is) designed to look at fuzzy gas clouds in the solar wind," Battams said. "That's what Mars is, that's all MAVEN cares about, that there's a gas cloud sitting in the solar wind. And it's got a comet coming along. It's smaller, but it's another gas cloud sitting in the solar wind, and it's going to see these two interact. "It's an extraordinary coincidence, and I think we're very lucky to see it. It could well be we don't see anything like it again in our lifetimes. It could be centuries before something like this comes along. So I'm glad we've got the chance to get some good observations."